Arrow is centered around two really important and really complex themes — identity and family. If you actually boil the show down and sift through its episodes and its relationships and its pieces, you'll find that this isn't a comic book show after all. It's mostly just a show about a broken, tortured, messed-up man who is trying to claw his way out of the darkness. It's a show about what it means to be a family when your family lies and does terrible things. Arrow is a series that asks who our family truly is — are they the people we're linked to by biology or by familiarity and trust? And then, when it asks about identity, it begs us to consider who we are as human beings and heroes. Are we the sum of our past mistakes or good deeds? Once we succumb to darkness, are we doomed to it? Can there even be both lightness and darkness inside of us, or will darkness always win in the end? If this show sounds awesome, you'd be correct. 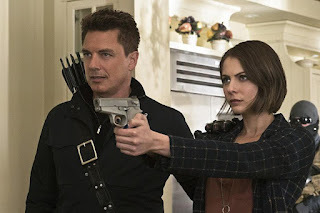 Unfortunately, the really complex and interesting themes that Arrow lays its foundation on are often overshadowed by romantic drama, ridiculous flashbacks, and forays into sub-plots that bear little to no meaning on the story at large. Season four of the show has seen a lot of these missteps, and occasionally I have to remember what drew me to it in the first place in order to keep watching. As this season begins its descent, the series is trying to tie together its loose ends in order to form a cohesive quilt-like narrative. "Lost in the Flood" is this season's penultimate episode. And though it's hard to fall into the trap of horrible, rage-inducing stupidity that last season's penultimate episode fed us, that doesn't mean this episode was flawless either. In fact, it was basically just a (decent, don't get me wrong) string of set-ups, plot bridges, and literary references. Let's discuss, shall we? Before I discuss the theme of family which was super prevalent in both the A and B-plots this week, I want to talk about this idea that is supposedly the crux of Genesis — hope for humanity. In the episode, Diggle and Oliver (far too easily) infiltrate the Dome, which leads them to a family of people who actually aren't being brainwashed to live in Pleasantville/The Hunger Games. They, like nearly everyone else in Star(ling) City, have seen disasters and destruction, and the evilness of the world. They can't fathom the notion that the world is even good or that there are heroes still out there. In fact, this family points out the fact that Damien has provided them with hope, while Green Arrow has offered none. This stays with Oliver, more than most things do, and he tells Diggle that the family is right — he's been fighting all season, but has he really done anything better as the Green Arrow than he did as The Arrow? Is he actually doing what this costume and new identity set out to do in the first place? It's a question that should have been asked more throughout the season in subtler ways, but Arrow is not known for its subtlety. Yes, Oliver has questioned this idea of becoming a beacon of hope — of operating in the light. But at nearly every chance he's gotten this year, he's chosen the darkness. He literally decided not to go out in his Green Arrow suit just last week because it was dangerous to be in the light. Remember when Oliver was running for mayor? Remember the hope that he wanted to inspire? The change he so desperately believed he could bring? We're one episode away from the finale now, and back to the season premiere in terms of theme, it seems. And quite frankly, I don't know how the season will end. How can Oliver inspire hope when he's spent this entire year shying away from the light? And why did the Arrow writers choose to abandon this theme and this idea — which is compelling by the way — halfway through the season in favor of some shoddy soap opera plot? I would have much rather watched Oliver slowly become a hero in the light. But it's too late now. And just like last year was far too late to redeem Al Sah-Him, I feel that this season is going to be much of the same in terms of the writers trying to redeem this idea of hope and fighting in the light. Arrow's problem has always been that it has no idea the volume by which to press issues or feed the audience themes. They either forgo themes altogether for some detours into absurdity (let's all just agree to forget about some of the stuff that happened this season, okay? ), or they shove ALL the metaphors and imagery possible into one episode. Enter: "Lost in the Flood"! While the theme of hope and the idea that Darhk and Oliver are essentially fighting for the same thing in two very different ways is majorly compelling, the show spent way too much time this season on magic that it left the reality of its characters and their complexity in the dust. Nevertheless, I guess this episode did finally address the uncertainties Oliver had about being a beacon of hope. Who knows. It seems like it's the first time he's really thought about it, even though the show has been pretty much building toward it from the first episode of the season. Here's one thing I will say though that I liked a lot: the parallelism between Ruve's death and Tommy's death, right down to the framing of the scene. Oliver loved Tommy. He cared about him like he was flesh and blood. And so Oliver adhered to the unspoken promise in Tommy's final moments and tightly gripped his legacy. That death meant something to Oliver. Tommy died saving Laurel — an act of love. And he also died knowing that Oliver didn't kill Malcolm. The reason that Ruve died was because of her malice. She threatened and paraded around with Darhk, and didn't care who she hurt in the process. So when Lonnie stabs her, Ruve essentially got what she deserved. But what I find fascinating is that the show could have easily made her a villain in her last breaths. Think about it: she could have said a number of things about how he would never stop Darhk or something like that. But no, Ruve didn't do that. She used her last breath to request a promise from Oliver — take care of her daughter. Ruve used her final moments not to think about herself, but about the one she loves most. And the fact that Oliver is once again faced with a person in the rubble dying and asking him either a spoken or an unspoken promise is not lost on the audience. It's also not lost on Oliver. Because he agrees to protect Ruve's daughter. Oliver is a father (sometimes I forget that, and I wish I could forget the story that fact is associated with) and now I think he looks at children a bit differently than he did before. Ruve dies knowing that her child will be okay. Tommy dies knowing that Oliver is a good man. In both instances, Oliver is a hero. I love Team Smoak in this episode. And honestly, I'm really glad we got some insight into the fact that Donna left Noah, not the other way around. It makes a lot of sense, given what we know to be true of her character. What I will say as a criticism though, and this comes from the show shoehorning cast members in, is that Felicity's whole response to her father and her excitedly telling Curtis that Donna left him, not the other way around, feels out of place. And I think it's just because some of the strongest memories I have of Felicity from the early days are where she talks about her father's abandonment. That's not just something a person gets over in thirty minutes. Honestly, Felicity should be a little mad at her mom for what she did. She should be mad, then compassionate, and then forgive her mom after realizing that her strength was walking away. But instead, Arrow has left Felicity's story kind of dangling in open waters here. There is simply not enough time in the penultimate episode to flesh out this family drama with the kind of arc it actually deserves. Furthermore, I'm actually really kind of baffled that the show had Curtis tell Felicity that there are parallels between her and Oliver and Noah/Donna. In the words of Community's Dean Pelton: "That... was an odd dot to connect." I really don't know if the show should be comparing the romance they (until this season) had constructed to be on the fast-track to healthy with the relationship between a pathological, lying criminal and a woman who left because she was afraid to see her marriage end in disaster. Curtis is onto something, though: Donna and Felicity are alike in their strength. Both women were strong enough to walk away from situations they knew could only end in unhealthy disaster. I still hold firm to the idea that Oliver and Felicity should spend more time apart, and it looks like I may be getting my wish. If they part ways in the season finale for whatever reason — whether Felicity leaves Star(ling) City for a while or something else — I will be glad. Those two need some time to continue growing and exploring apart from one another before they're ready to be in a healthy, functional, long-lasting marriage. If they jump back in now, the only reason will be because the lives they live make them fearful that they'll lose one another. Fear is not a great way to rekindle a relationship, especially one that is already familiar and comfortable. Oliver needs to find his hope within himself. He needs to be his own beacon of hope for once. He can't keep relying on Felicity to always be there. That's just not healthy. And Felicity needs to presumably deal with her own stuff (although apart from a brief moment where she watched the news, apparently she's now totally fine after sending a nuke to a town where tens of thousands of people died, because Arrow can't properly pace its stories), away from Oliver. She was the one who wanted to return to the city, and I think it would make for some fitting book-ending writing if she was the one to realize she needs to leave it again for a while. I'm still an Olicity fan, but examining the damage that the show did to the pairing this year means acknowledging the fact that those two aren't healthy together — yet. I know the show will bring them back together in time (or I could be wrong and they'll be together next week in the finale), and I feel like that's exactly what we all need: time. One final thought: how did Noah leave so quickly without running into Darhk in the hallway? Does Darhk just Apparate places now?! Can he walk through walls?! As Arrow heads into the season finale, I'm filled with less rage and more apathy than I was last year. Apathy, unfortunately, is often more dangerous than rage. Because while "Lost in the Flood" didn't make me feel angry, it left me with the inability to feel much at all regarding the fate of our characters or the city. And that might actually be worse. I forgot to un-mute most of the flashbacks this week. From what I can tell, I'm actually gaining brain cells by muting them. Look, Arrow, we need to have a conversation about how flashbacks should be structured to be interesting and yet central to a plot we care about. Talk to the Quantico and Orphan Black writers. They can help you out. Charlotte Ross, Echo Kellum, Tom Amandes, and Emily Bett Rickards win for Best B-Story in a While. The chemistry between all of them was great (even if I did think that Curtis could tone it down a few notches; even Felicity — at her most overeager — isn't THAT babbly). It's now canon that Raven Reyes and Thea Queen can return from being brainwashed and fight against it. On another note, there were some little shout-outs to The 100 in this episode in terms of Diggle saying "Mount Weather" (which is a real place) and "ark." "Cool! I didn't even mean to do that!" Darhk is supposed to be the villain but sometimes Neal McDonough just makes him so much fun. Malcolm returned, to everyone's rolled eyes. He also brainwashed Thea again. Let's all take a moment to remember that I have to put "again" because THIS IS NOT THE FIRST TIME HE HAS BRAINWASHED HER. A regular father of the year, that one. I still love John Barrowman though. "And you make SO much more sense now!" "I am not pregnant. Is that the only news that a woman can have?!" Tonight alone, the show referenced The Bible, Hamlet, and Brave New World. A dog ran across a street in a scene and I yelled "DOGGY" at my television. I swear I'm twenty-seven. "She's strong. She's my daughter." Lonnie calling Thea his mommy will always be creepy. Dun-dun-dunnnnnnnn: Darhk shows up at La Casa de Felicity and the woman has Donna and Curtis stand behind her. What does Darhk want? To watch the world burn, of course! What happens next is anyone's guess. What did you all think of this week's Arrow? Hit up the comments below and let me know! sigh Is anyone else really creeped out by the fact that so many people from Star City were so willing to sign up with Darhk? It seemed they were entirely aware of his plan. They agreed that everyone else in the world should die, families just like theirs should burn because the "world is evil". I think Oliver has bigger problems than any big bad if the people of his city are so ready to give up, and not just give up but support the horror of HIVE's plan. That is some serious lack of empathy and ethics and if they are calling Darhk's plan "hope" they are really far gone. It creeped me out to see them so willing to live in a town patrolled by masked people with guns (and then Ruve takes a jab at masked people with weapons, irony much?) They have become part of group that is hurting people just as they were hurt. It's an all too common story of violence. It gets to the real reasons I check out of most super-hero stories eventually. One, the underlying assumption that violence is the solution to all problems (cause basically it looks so darn cool). And more worrying, the tendency of the faceless, nameless crowds to look to some "special" person to save them from all danger without said hero inspiring them to take responsibility for making the world a better place themselves but simply relying on an organization, government, power or hero to do it for them. The show really hasn't spent any time showing us Oliver giving hope to others so his self-critique there was justified. However, it's not all on his shoulders. People need to decide to take action for themselves. He can show an example but I don't think violence is the example that will ultimately help. Crime fighting is important but it is really just front line emergency care. Star City seems to be sick on a much deeper level. This episode just made me sad.